I did not leave San Jose particularly early and consequently didn't finish the 5hr drive to Weaverville until well after 1p, leaving me with about half a day's worth of sunshine. I wouldn't be able to do one of the longer day hikes I had in mind for the Trinity Alps until the following day, but there were still plenty of minor ones I could do in the area. Browns Mountain lies east and south of town, a 12-mile ridgeline of primarily forested terrain rising to less than 4,000ft. Oddly, there is a second Browns Mountain to the south across SR299 and the Trinity River, not really part of the larger one, but adjacent. The higher point is in the larger north mountain, a P900. Browns Mtn South is a P1K but some 700ft lower in elevation, and the highpoint of the southern section. Both appear to be on private property which led me to believe their could be access issues. Those lands owned one of the private timber companies are generally far easier to access than those owned by individuals, and without knowing just who owned the surrounding lands, I was in for a bit of a crapshoot. I drove first to Browns Mtn North. A decent dirt/gravel road off SR3 north of town got me within a mile of the summit, at a saddle to the north. Getting to the actual summit provided slightly problematic. The obvious route up on the better road from the saddle goes through a gate with a sign for Harphamville, population 1. An occupied residence beyond the gate seemed a certainty and the signs were unwelcoming. I went back down to the saddle and tried a second road to the left around the east side of the mountain. This, too, had a gate but no signs of regular travel. I followed this road around the side of the mountain, passing through someone's private shooting range (probably the same Mr. Harpham who lived in the forest above) and then through a property boundary with a gate that hasn't been opened in decades, probably. This made me feel much safer. I followed the road for about 3/4mi before leaving it to climb steeply up a slope just before the road crosses a gully. Above this slope I came upon another road (probably the one that goes through Harphamville), essentially having circled around the backside without ever seeing the residence (you can see it in on the satellite view, and a few others nearby as well). The road opened up to a clear-cut section of the mountain immediately north of the summit. I hiked up a this easy slope to reach the summit in about 30min's time. 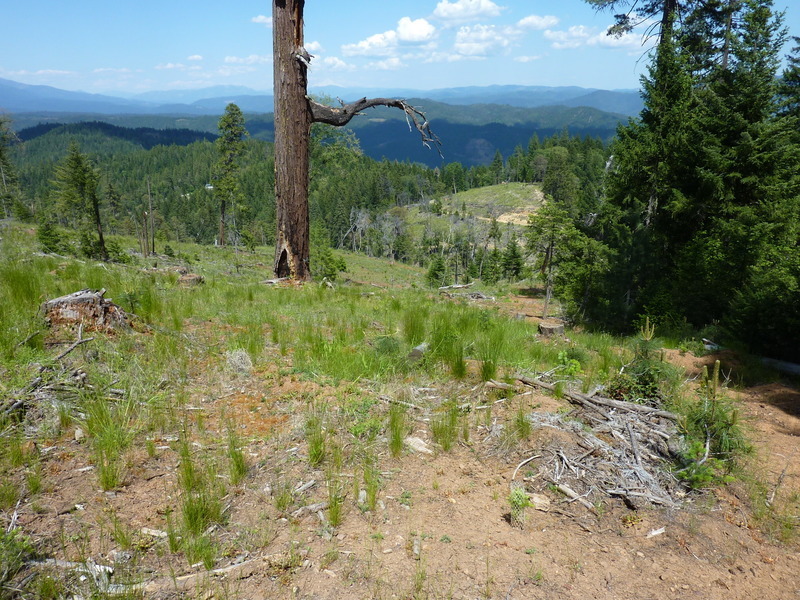 The clear-cut provides a view off the north side, but uncut trees around the summit block most other views. I wandered south to a second area (an equal height contour on the topo map) to get some views to the southeast towards Lewiston, but found that area lower than the northern one. By 3:10p I had returned to the van without seeing another soul - just the way I like it. I next drove back south of Weaverville for Browns Mtn South (I could have saved some driving if I'd done these in the reverse order). I had indentified beforehand a dirt road leading up from SR3 southeast of the summit. The road doesn't actually go to the top, but it provides the closest approach. I found the road gated just above the highway, though not signed for No Trespassing as I half-expected. The land is owned by Sierra Pacific Industries, one of the large timber interests in coastal California. The area was closed to vehicular traffic, but no prohibition for hiking or hunting. Or biking for that matter. The road turned out to be well-graded for bike travel and I took advantage of this to cover almost 3mi in about 30min. I managed to get a flat just before reaching my stopping point so there was no time savings by the time I was done with the repair. I left the bike off the side of the road when I was below the summit at the closest point, about 1/3mi. I hiked up forested slopes for the opportunity to catch fleeting glimpses of the surrounding countryside above the tops of the high manzanita that covers the summit. Luckily the route up from the NE was mostly through forest understory with only minor bushwhacking. The summit itself was a disappointment. Better views were had from the road during the ride up. The ride down was enjoyable and quick - made up for the flat I'd gotten earlier.